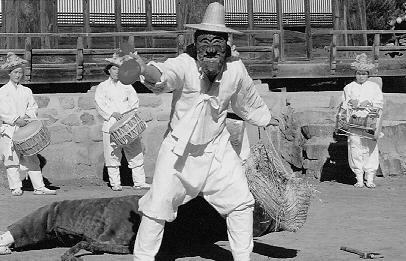 Hahoe Pyolshin-Gut T'al-nori is a mask dance drama handed down by lower-class people in the Hahoe Maeul, P'ungch'on-myon, Andong City, Kyongsangpuk-do since the middle of the 12th century. 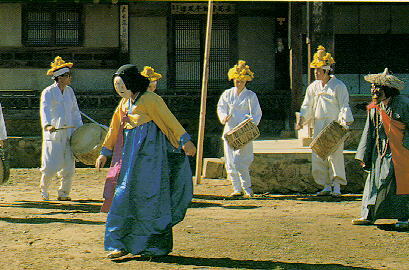 Hahoe Maeul, as a Pungsan Ryu's consanguineous village, has quite well preserved the life and culture of our ancestors. The entire Village has been designated Important Folk Material No. 122. Its topographical features resemble a floating lotus upon the stream, and the Naktong river and the mountain range surrounding the Village form the Taegeuk (Yin-Yang) symbol. Its situation is not easily accessed by foreigners, for to the east of it is located Hwasan and to the north, south, and west is the enveloping Naktong river. These geographically isolated conditions have rendered Hahoe Maeul safe from foreign invasions several times. Its magnificent natural surroundings had aroused very exuberant feelings in the Village people, and thus had been an impulse in the creation of the masterpiece of Hahoe Pyolshin-Gut T'al-nori. preserving its peculiar dramatic characteristics. 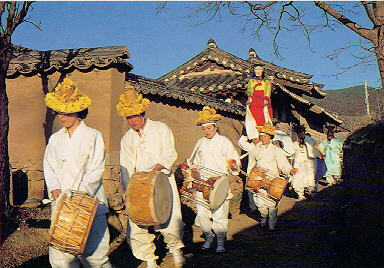 Village sacrificial rituals had been performed on January 15 and April 8 (Buddha's birthday) of each year by the lunar calendar in the Hahoe Maeul. 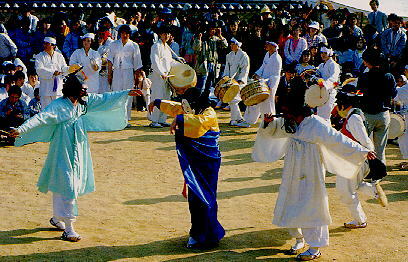 Seonghwangshin of the Village was called the goddess born in the year of Mujin, and the annual ritual for this seonghwangshin was Dongje (or Dangje i.e. Village Ritual). 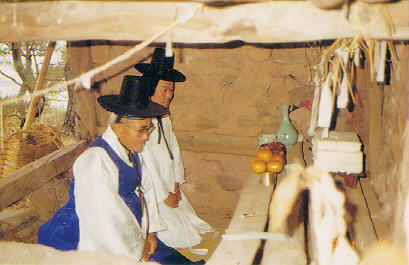 Pyolshin-Gut T'al-nori together with Dongje had been performed by an oracle (god-descending) every three, five, or ten years when diseases or epidemic occurred in the village. through Chung i.e. a Buddhist Monk's violation of a commandment, and satirically delineates the joys and sorrows of the ruled common people. Likewise, the lower people of Hahoe Maeul had no reluctance to satire the society and reveal their suppressed feelings. 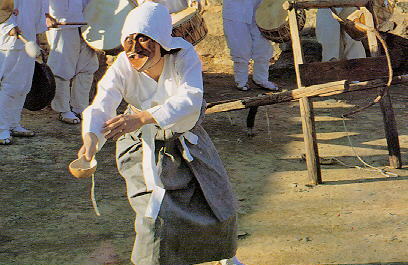 T'al-nori, which criticized the ruling classes of the society in which status and order were highly observed, was performed under Yangban's tacit consent and financial support in Hahoe Maeul, the Yangban Village. 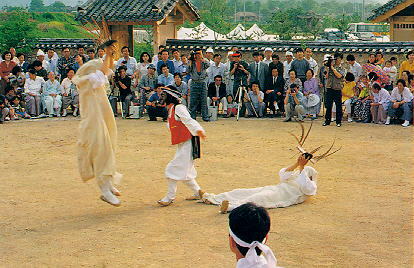 The performance resulted in the harmonious life between upper and lower classes, Yangban and Sangmin. For it was possible for Sangmin to settle their oppressed feelings, and for Yangban to understand their way of life and to reduce their complaints. Thus, the conflicts and problems between classes in the inner part of the community had passed through the shock-absorbing process of T'al-nori performed as one of village rituals of Pyolshin-Gut, and once more had the function to reinforce the existing structural systems of the community. Kangsin (Invocation to a god) represents prayers for a local god to descend at the local shrine. Ringing bells on a god-descending tree symbolize the descendence of the god. The other big tree hanging the bells becomes the divine body of the local god, and only where the tree stops, can the Hahoe Mask Dance Drama start. 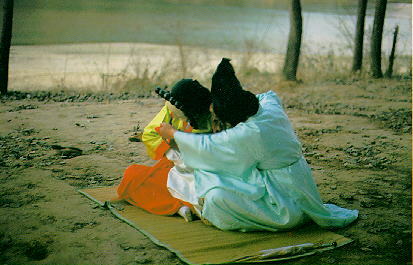 Kakshi (The Young Girl) enters "on the shoulders of a man" (Mudong). Kakshi is the personification of the local goddess. Her frequent asking for rice and money may be traced to a divine origin. Her actions ensure virtues and blessings from the local goddess. Kakshi should never touch the earth. She is always above the common people. Playing the role of the local goddess is demontrated by always being carried on the shoulders of a man. Chuji signifies lions, and they sanctify the performing ground by driving away demons and evil spirits. Paekchong (The Butcher) has the instinct to strike down a bull and remove its heart and testicles. After that, Paekchong satirizes the authoritative attitudes of the ruling class who suppressed feelings toward sexuality. Paekchong makes fun of the ruling class with his humorous speech. His actions cause the spectators to laugh and be sympathetic as the act releases the ties of sexual taboos. Halmi (The Granny) exposes her miserable life she has led since she became a widow when she was 15 years old by singing Beteulga (a song for a loom). 일평생을 시집살이 아구답답 내 팔자야. Pune (The Flirtatious Girl) suddenly crouches and urinates. At that instant, Chung (The Wandering Monk) is stirred by watching her. They dance together and then are detected. This act satirizes man's instinctive conflict and reveals the corrupted state of the monks in those days. Yangban (The Aristocrat) and Sonbi (The Scholar) take pride in their status and knowledge in fighting to get Pune, the flirtatious girl. They cease to quarrel and dance together with Pune. They will fight again over buying the bull's testicles from Paekchong. They are criticized by Halmi and exit at the sound of "give your tax". The simple Honrye (wedding ceremony) takes place on a straw mat prepared at a field near the entrance of a village after the sun sets. This act discloses the first night in the bridal room. Sleeping on the mat signifies fertility and productivity. It is generally believed the pair will produce a son. This act is held at midnight to keep alive the mood of the Shinbang (the bridal room). 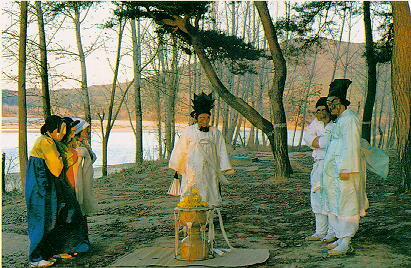 Chonggak (The Bridegroom) approaches Kakshi (The Bride) and loosens the knot of her upper wedding attire. He then embraces her and they lie down. As below is Hahoe Village.